Commentary and Spiritual Perspectives, Ordinary 7, 2015. Commentary, historical background, poems and readings. Center for Liturgy, St Louis University. Español. "Paralytic on a Platter," D. Mark Davis, Left Behind and Loving It, 2012. The Lectionary Lab, Epiphany 7, the Rev'ds Dr. John Fairless and Delmer Chilton (aka "Two Bubbas and a Bible"), 2012. Lectionary Notes, Epiphany 7B, Beth Quick, 2012. "Removing the Roof," Katie Munnik, Presbyterian Record, 2012. "Digging down to healthy understanding" Peter Woods, I Am Listening, 2012. "They Removed the Roof," Martha Spong, Reflectionary, 2012. "He's a Legend," Neil Chappell, a weird thing, 2012. Daily Reflection, Ordinary 7, 2012, Larry Gillick, S.J., Creighton University. Reflexiones Dominicales en español. "Letting Go of Your Story: Learning from Traudl Junge," The Journey with Jesus: Notes to Myself, Daniel B. Clendenin, Journey with Jesus Foundation, 2006. "Perceiving with Compassion," Michael Hopkins, "Proclaiming Gospel Justice: Reflections on the Scriptures and Progressive Spirituality," The Witness, 2006. "Deliverance," Robert Roth, "Healing People, Healing Nations," 2006. "Dose of Forgiveness," Debra Farrington, 2006. "Lame Excuse," Barbara Crafton, 2003. "Twice Healed," Douglas R. Loving, 2000. "Guilt," Frederick Buechner Sermon Illustrations. Lectionary Notes, Epiphany 7, Rev. Beth Quick and the Lectionary Chat Group Bible Study of St. Paul's UMC, Oneida, NY. Worship and Liturgy Resources, Ordinary 7 - Epiphany 7, by Rev David Beswick, Uniting Church in Australia. Liturgies Online, Epiphany 7, by Rev Moira Laidlaw, Uniting Church in Australia. Lector's Notes, Ordinary 7, Gregory Warnusz, Saint Jerome Parish, Bellefontaine Neighbors, MO. Notes and commentary for those reading this week's lectionary texts to the congregation. Healing Prayers, MomPriest, RevGalBlogPals, 2009. "Liturgy: prayers reflection", reflections on the collect at the Eucharist, Rev. Bosco Peters, New Zealand. Call to Worship, Feb 19, 2012, Mary Jane Konings, Timaru, New Zealand. HermanoLeón Clipart, Ordinary 6. Free clipart, backgrounds, slides, etc. 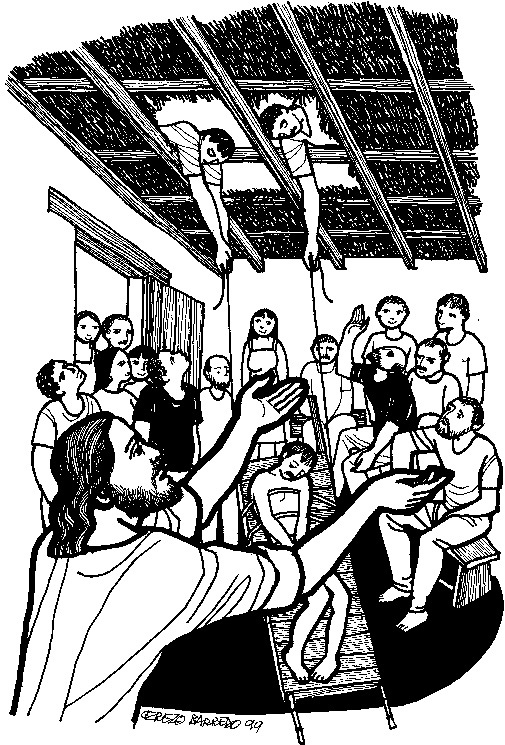 Clip Art Images: Mark 2:1-12, Misioneros Del Sagrado Corazón en el Perú. Ordinary 7 at Cerezo Barredo's weekly gospel illustration. Follows Latin American Roman Catholic gospel reading, though most gospels texts/themes are found in the index. Liberation emphasis. Hymns of the Spirit Three, Epiphany 7B, Richard E. Hurst, Universalist National Memorial Church. Lectionary Hymns, Ordinary 7B, National Association of Pastoral Musicians. Choral Anthem Project, Ordinary 7B, National Association of Pastoral Musicians. Jesus Heals the Paralytic, Dianne Deming, Children's Sermons Today, 2012. Story for Children's Worship and Family Activity, Ordinary 7, at word-sunday.com: A Catholic Resource for the Lectionary by Larry Broding.